Friday the 13th is a lucky day for NASA's newest moon probe. Today (Sept. 13), NASA's Lunar Atmosphere and Dust Environment Explorer (LADEE) spacecraft performed the first of three major burns expected to send the probe into orbit around the moon. LADEE (pronounced "laddie") executed the burn at 12:38 p.m. EDT (1600 GMT) when it was at its closest point to Earth in its elliptical orbit. NASA officials report that the burn went well and the loveseat-sized spacecraft is functioning normally. "We have successfully completed the Perigee Maneuver main engine burn," NASA officials wrote in a mission update. "Flight Dynamics preliminarily reports that it was a good burn, and will confirm later in the orbit through ranging … The spacecraft also successfully went through its first eclipse, and operated as expected." LADEE now needs to perform two more of these burns that will send the probe into ever-higher orbits around the Earth before the Oct. 6 burn that will insert the spacecraft into lunar orbit. Once in orbit around the moon, the $280 million LADEE mission is tasked with studying the moon's thin atmosphere and the mysteries of lunar dust. 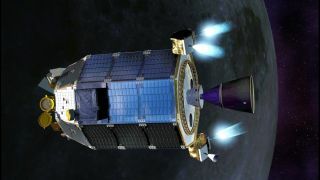 Depending on how much fuel remains on the spacecraft after its burns, the probe is expected to perform about 100 days of science before crashing into the surface of Earth's celestial neighbor. The moon's atmosphere is actually representative of the most common kind of atmosphere in the known solar system, NASA officials have said. By understanding more about the lunar atmosphere, scientists might be able to glean more information about the atmospheres that surround Mercury, moons orbiting other planets, and even some large asteroids. LADEE launched into space atop the maiden voyage of the Minotaur V rocket from NASA's Wallops Flight Facility on Wallops Island, Va., on Sept. 6. The nighttime launch was flawless and could be seen up and down the east coast of the United States.